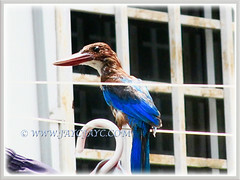 Kingfishers are a family of small to medium-sized and brightly coloured birds. 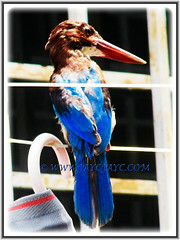 This White-throated Kingfisher is large, 27-28 cm in length. The adult has a bright blue back, wings and tail. Its head, shoulders, flanks and lower belly are chestnut and the throat and breast are white. The large bill and legs are bright red. The flight of the White-throated kingfisher is rapid and direct, the short rounded wings whirring. In flight, large white patches are visible on the blue and black wings. Sexes are similar, but juveniles are a duller version of the adult. All kingfishers have large heads, long, sharp, pointed or dagger-like bills, short legs and stubby tails. Most species have bright plumage with only small differences between the sexes. The kingfishers have excellent vision. They are capable of binocular vision and are thought in particular to have good colour vision. The irises of most species are dark brown. Range: The kingfishers have a cosmopolitan distribution, occurring throughout the world’s tropical and temperate regions. Habitat: White-throated kingfisher is a common species of a variety of habitats, mostly open country in the plains but has been seen at 7500 ft in the Himalayas with trees, wires or other perches. The range of the species is expanding. This beauty is widespread and populations are not threatened. 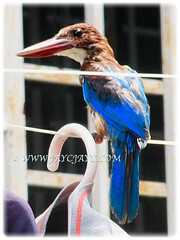 Breeding: The White-throated kingfisher begins breeding at the onset of the monsoons. Males perch on prominent high posts in their territory and call in the early morning. The tail may be flicked now and in its courtship display the wings are stiffly flicked open for a second or two exposing the white wing mirrors. They also raise their bill high and display the white throat and front. The female in invitation makes a rapid and prolonged kit-kit-kit call. The nest is a tunnel 50 cm long. The nest building begins with both birds flying into a suitable mud wall until an indentation is made where they can find a perch hold. They subsequently perch and continue digging the nest with their bills. Nest tunnels in a haystack have also been recorded. A single clutch of 4-7 round white eggs is typical. The eggs take 20–22 days to hatch while the chicks fledge in 19 days. Feeding and diet: It perches conspicuously on wires or other exposed perches within its territory and is a frequent sight in south Asia. This species mainly hunts large crustaceans, insects, earthworms, rodents, snakes, fish and frogs. Predation of small birds such as the Oriental white-eye, chick of a red-wattled lapwing, sparrows and munias have been reported. The young are fed mostly on invertebrates. In captivity, it has been noted that it rarely drinks water although bathing regularly.